At the beginning of May was teacher appreciation week & you may have seen my School and Teachers post here! We love my children's teachers & another great time to show your appreciation for them is at the end of school year parties! 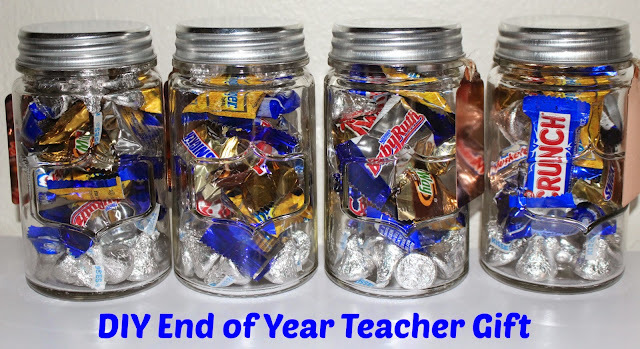 We have an end of school year party every year & this year I knew the perfect gift to give! I absolutely love Target's dollar section & that's exactly where I found all of my supplies for this easy DIY gift! I grabbed a few different bags of chocolate candy, everyone loves chocolate right?! I filled up the mason jars with a ton of chocolate, added the metal tag, put the lid on & that was it! You could also spruce these up even more with chalkboard labels, add in colored pens, etc. I love that the teachers will be able to re-purpose these adorable jars! So what do you think? I hope all of my children's teachers love their end of year gift! Such an easy and inexpensive gift idea! Thanks for sharing!